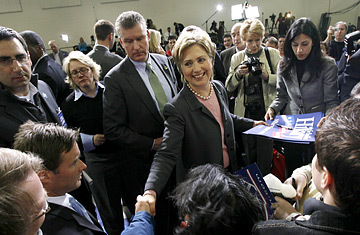 Senator Hillary Clinton (D-N.Y.) shakes hands with supporters as she campaigns at East High School in Des Moines, Iowa, January 27, 2007. TIME: What surprised you about this first trip to Iowa? Is there anything you want to do differently the next time you go out? CLINTON: I was really excited by the intensity of feelings that I encountered in all of the events, large and small, and the energy that people brought to the events they came to. People were really geared up. It felt more like a week before an election than a year before an election. There was that much emotion and intensity and energy. I was delighted with the whole weekend. I though it went extremely well, thanks to all the hard work that everybody put into it, and I was pleased that I got to go to so many different places, and not just stay in one place, and obviously, I'll go to many more when I go back over the succeeding months. One thing that surprised me were the number of questions I got about No Child Left Behind. I know that's a problem for people, but this was more intense than I had expected. You know, just thinking about it, the other thing, have you ever been to the Drake Diner? Well, every time I'm in Des Moines, which has only been what? like three times in the last seven or eight years, but every time I go, I go to the Drake Diner, because it has great chocolate milkshakes, which this is like the only place that I have one. And I was sitting in a booth there, and I was so touched by all the people who came upthis was before I had done anything; this was Friday night around 6 o'clock and I was just so touched by all the people who came up to talk to me and to welcome me to Iowa and tell me how happy they were. And some even to tell me that they were supporting me. And you know, the young women who came wanting autographs or wanting to tell me they were teachers or they were students or they were nurses. It was really touching to me that there was so much personal outpouring toward me, especially since I hadn't been there in so long. TIME: Could you describe how you decided to run? Was there one last thing that put the decision over the edge? Was there one thing that you finally had to work through to decide that you actually wanted to do this? CLINTON: Well, I spent a lot of time with my family over Christmas, and Bill and I went away for a few days over New Year's, and that gave me the spacethe psychic spaceto really think it through because I hadn't focused on it with the level of seriousness it needed until after my election [to the Senate]. I mean, I knew I was going to think about it, but then it came to actually have to think about it, and we were still working in the Senate. I was receiving a lot of advice from peopleall kinds of people who wanted me to run, who had ideas for me, but I needed the quiet space to really talk to myself about it. Really, right after the first of the year, I decided I did want to do it, that it was the right thing for me to do and that I thought I would win. So I made the decision and told my staff that it was a go and we needed to get ready. TIME: Was there any last doubt? CLINTON: Well, there were lots of doubts that I worked through from the November election, until I made the decision. But those are the kinds of concerns anybody who is going to enter into this high-stakes political election would have to ask. So I went through and just thought to myself, do I really . I sort of started from the back. Do I believe I would be the best person to be President in January, 2009, to undo the damage of the last years, and to put us on the right path? And I really believe I would be. And then, believing that, can I put together a campaign that will win the nomination and win the general election? And I believe I could do both of those. And then finally, do I really want to do this? Is this how I want to spend the next two to 10 years of my life? And the answer is, yes, that I've invested an enormous amount of time and energy and commitment in trying to do what I can to help my country and I'm really heartsick about the direction this President has taken us, and I don't want to be just on the sidelines. I want to try to influence what we do going forward. TIME: Let's talk about the war. There is this strain of very angry people in the Democratic electorate. This is the thing that all of your competitors are coming after you on, whether it is John Edwards saying you're not being strong enough. Joe Biden's taking shots. Do you think that as you're talking this out with votersand you did that a lot this weekendcan you feel that you're making any progress with the people who are upset and just want you to say, I was wrong? CLINTON: I've gone through this, certainly in New York. I had a primary that was all about the anger and frustration people legitimately feel about the war this President launched and the way that he has conducted it. And I feel the obligation to talk and listen to people about it as long as they want to engage with me, because I want them to know what I think and what I believe should be done. And I believe that as people actually hear me and meet with me, they understand that this is a complex issue that I'm trying to provide leadership on and work our way through. And as I said in Iowa, this is George Bush's war, and he's the one who needs to extricate us from it. He has really engendered so much anger and outrage in the electorate, and I understand people's deep desire to have it end. There this idea that, somehow, we should just end it, and we are trying in the Congress to come up with means to influence this President. But the reality is, we have very few tools that we can use to to force him to change, because he always can veto anything we pass and this President has a history of ignoring what we pass anyway, even after he signs it into law. So our job is to continue to build political opposition to his policy. And certainly, that's why I'm so strongly against the escalation and would do everything I can to prevent it from going through or try to limit it and up the political pressure on him doing whatever is necessary to begin the end to this war as soon as possible while he is still President. TIME: But there does seem to be a strain of Democrats who just want you to say the three words: I was wrong. CLINTON: Well, I've said over and over again, knowing what I know now, I would never have voted for it. The President was the one who was wrong. The President led people to believe that he would be prudent in the exercise of the authority he was given. That proved not to be true. I think keeping the focus on the President and Vice President about what they did and didn't do, the mistakes they made, is really where it needs to be, because he's the only one who can reverse course. TIME: Listening to you talk about health care, you seem to be a lot more open, at least than I can recall you being, to single payer, the kind of government-run system they have in Canada. And I was also struck on one of your stops, about an employer mandate, where you said that if employers were required to provide health care to their employees, a lot of employers would say goodbye. In 1994, people argued that, and you didn't seem to believe that was the case. Could you talk about your own evolution in your thinking as to what is the right policy here? Obviously, this is still a work in progress with you. CLINTON: What I'm trying to do is to outline clearly for people what our options are. And I think at one of those events I said, really, there are three big ways, either individually or in combination, that we can get to universal coverage, and universal coverage my goal, and I think increasingly, there's political consensus for it, which there wasn't back in 1993 and 1994. There wasn't even the means of getting there. There wasn't really an agreement that we needed to go there. And that has changed. So what I'm trying to do, in a straightforward way, is say, look, I know how difficult this is. Probably nobody knows better how complicated the politics are. I'm ready to get out there again. I'm ready to roll up my sleeves and work with people. But this time, I want to be sure that we have a political consensus about what we can accomplish together, because there will be a tremendous amount of pressure from those who don't want to change the system as we know it, because they do well by it. So we have to go into this with our eyes wide open and with sufficient political will to be able to overcome the opposition. I've watched what happened in Massachusetts, and what is now happening in California. That's why I think it's exciting that the states are serving as laboratories of democracy. So I'm not going to be saying, here's the only way to get there. I want to set the goals. I want to set the principles that I believe have to undergird the achieving of those goals and I want to set forth the different means of realizing them, and then really have it be part of the conversation, and as I go forward, talking about what I think would work better than other options to get where we need to be. But this is more about setting the goal and mustering the political will that will enable me to hit the ground running in January 2009, with I hope an even bigger Democratic majority in Congress to try to actually get it done. TIME: I noticed that when you polled your audiences on the three different approaches to get to universal coverage, both times I saw, single-payer won, hands down. Would that have been the case if you had asked that same question in 1993? CLINTON: I don't think so. Back then, when I used to speak about health care, there were a lot of people who honestly didn't know Medicare was a government program. I remember being stunned by that the first time I encountered it, and then it happened on several occasions. People know a lot more about how health care is delivered now. They know a lot more about what they pay. People were insulated from costs in many instances, because it was just something their employers did, and they weren't really even asked to contribute much and global competition wasn't that big a deal for well-paid, well-insured workers. So the last 14 years has caused a lot of serious thinking by all kinds of folks. The number of doctors who come up to me and say, I wish we had done what you wanted to do back in '93 and '94. There's an openness to considering different approaches that never would have been viewed as viable before. TIME: But your husband was a free trader..
TIME: What's this evolution about? CLINTON: I think it's about the changing world in which we find ourselves. I believe very much in trade. Trade on balance has been very good for America. But I don't see how anyone can look at what's happened in the global economy and not ask yourself, what are we missing here? Why is it that we have such a huge trade deficit with the world, particularly with China? Is it all because we can't compete? I don't think so. Is it because the rules are not being enforced? Is it because most other governments in the world take actions that maximize the positive impact of their trading relationships for their workers? I think so. And it's not just China, which is just the most egregious example. I issued a report earlier this year about some of the problems we have with Canada, our very good neighbor and ally along our border. We have trouble getting New York agricultural products into Canada. And I believe that it's because the federal and provincial governments of Canada, they protect themselves. They protect their farmers. They are not going to just open their borders regardless of what NAFTA says. I voted against CAFTA [the Central American Free Trade Agreement], because I looked at the facts and I thought we have no environmental or labor standardssomething that I believe is within the rubric of free trade. Free trade doesn't mean trade without rules. It doesn't mean a race to the bottom. It's supposed to be based on comparative advantage, so the trading partners all improve their standard of living. If you don't have some rules that will create conditions for employees to be treated fairly, the money is all going to go to the pockets of the elite. I heard the other day that in Mexico, they are importing cheap labor from Central and South America. Meanwhile, you have all of these ambitious, motivated Mexicans leaving their country to get a better life in ours. There's something wrong with this picture. TIME: Do you think NAFTA [the North American Free Trade Agreement, signed by Bill Clinton] was the right thing to do? TIME: That was your husband's Adminstration, wasn't it? Because I recall a lot of debate about it not having labor standards and environmental standards. CLINTON: But it was inherited. NAFTA was inherited by the Clinton Administration. I believe in the general principles it represented, but what we have learned is that we have to drive a tougher bargain. Our market is the market that everybody wants to be in. We should quit giving it away so willy-nilly. I believe we need tougher enforcement of the trade agreements we already have. You look at the trade enforcement record between the Clinton Administration and the Bush Administration, the Clinton Administration brought more trade enforcement actions in one year than the Bush Administration brought in six years. For me, trade is who we are. We're traders. We want to be involved in the global economy, but not be played for suckers. As we look at trade today, I don't think we can look at trade separate and apart from how we fix health care. I don't think we can look at it separate and apart from how we incentivize and pay for education, so we keep trying to improve the skills of our workforce. And I think that the budget deficit has mortgaged our future and the holders of the mortgages are governments like the government of China, so then it makes it even more difficult for us to get tough when it comes to trade. So we've kind of walked into this vicious cycle and we need to break it. TIME: So is there anything else you can tell us on how you cope with the campaign? CLINTON: Well, I love to campaign, so for me being out there, it is very invigorating. It is physically tiring, because there are long, long days, but I felt great all weekend. I thought, this is so much fun and I felt good about the reception I was getting. The other thing I understand is that voters in Iowa take their responsibility to shop very seriously, and I respect that. And I intend to do this, as I kept saying over and over again, the Iowa way. I will go back. I will answer people's questions. I will make them feel more comfortable and open to me. And hopefully, get a positive response. You know, I know I have to earn every vote. None of that worries me. I'm going to take a warmer coat next time.